Knot-tying arts have developed independently in different parts of the world. Some of the earliest decorative knots from China still in existence today are from the period 481 to 221 B.C., according to the County of Middlesex Cultural and Heritage Commission. Over time, the Chinese developed many uses for knots, including clothing decoration, buttons and household objects. Macrame, a craft of tying knots to create intricate patterns, is said to have developed in 13th-century Arabia. Arabian weavers are thought to have started creating knotted patterns with the fringe at the edges of items made on a loom. In following centuries, the practice traveled to Italy and France. Sailors picked up this knot-tying practice to pass the lectime at sea. To this day, the basic knots used in macrame are the same knots that are an invaluable part of the sailors' knot-tying repertoire: the half knot, the square knot and the half hitch knot. Macrame became popular in 19th-century Britain and was revived in the U.S. in the 1960s; although its popularity waned in the following decades, macrame appeared alive and well during the beginning of the 21st century. 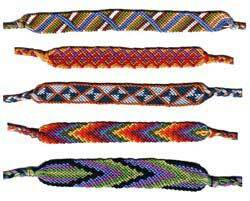 Life Script suggests that the friendship bracelet is a direct descendant of Central American Indian crafts. The friendship bracelet first appeared in the U.S. during the 1970s when it was popular to wear ethnic items. Because the candy stripe friendship bracelet is a rather simple and common form, it is a good one for beginners. To begin, three strands of embroidery floss 60 inches long are needed. The floss strands are held lengthwise and folded in half. A knot is made at the looped end, leaving a loop about one-half inch at that end of the bracelet. This loop may be taped to a table or chair or pinned to a craft pillow while the bracelet is knotted. The piece of floss on the far left is brought up over the second string so it resembles the shape of the number four and is then pulled back around the second string through the opening of the four. This sequence is repeated in the same manner with the same two pieces of string to form two identical knots. Working in this same manner, the first string is used to tie knots on the third string, and then each successive string until the end of the row is reached. The process is continued with the new string on the farthest left, which is now used to tie knots on each successive string. Rows are added until the bracelet reaches the desired length. At this point, the strands are separated into two separate groups, and each group of three strands is braided until it is at least four inches long and then knotted. The ends of strands are then trimmed. Now the bracelet is ready to be tied on the wrist of a friend. One of the two braided ends is pulled through the loop, and the two braided ends are tied together. Patterns for more complex friendship bracelets made from floss, such as chevron, hearts or double chevron as well as others, are available on websites such as How to Make Jewelry. 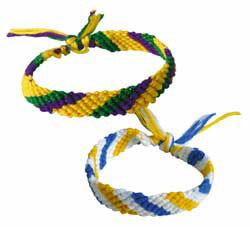 A friendship bracelet could also be made of hemp, linen, silk, gimp (plastic lacing), cord or string. Younger children may enjoy simply braiding three pieces of fiber to make a simple and quick variation of the friendship bracelet. Beaded, wire and leather friendship bracelets are other options to make a bracelet that is a bit more out of the ordinary.